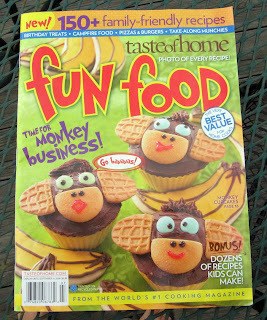 Last summer I featured a special issue from Taste of Home magazine called Fun Food. I was surprised to find a Fun Food special issue again this summer! I guess it's an annual summer thing. Abigail really likes the cover photo and told us that the cupcakes had butterflies on them. It's kind of weird because she loves monkeys. I thought she would recognize them. I found my copy of this magazine at Sams. I'm sure it's also available at Costco, Michaels, JoAnns and grocery stores. It's on sale until September 21, 2009. I was not able to find it on the Taste of Home website, though (perhaps I didn't look hard enough). Do you have a favorite fun food that you like to serve your family? I bought this issue at Walgreens! I thought it looked so cute and can't wait to try some of the things for Matthew! My family loves my Taco Ring, which is quick and easy!